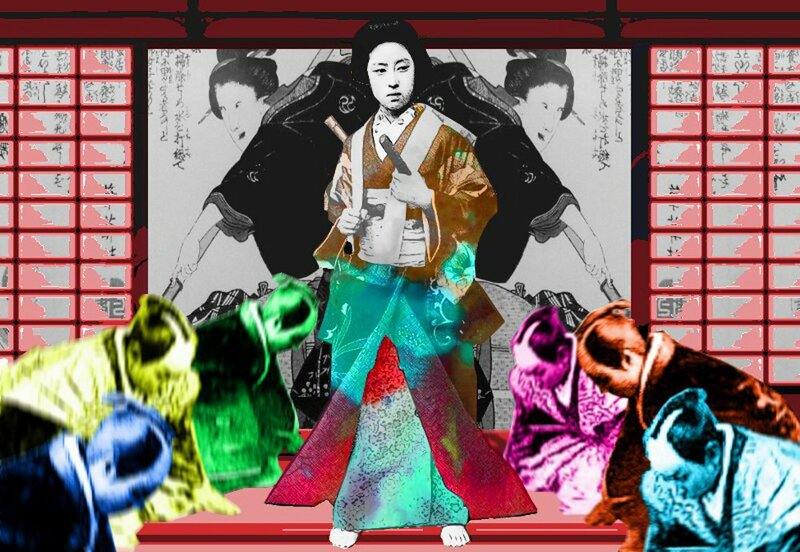 There is some debate with Japanese historians whether or not the female warrior class of feudal Japan, the Onna-bugeisha, functioned in the way today’s popular culture currently portrays them. The more conservative view is that there might be two or three of isolated occasions when high-born women trained for and participated in warfare, but to say anything more would be pure poppycock dreamed up by wishful thinkers. I don’t personally buy that. 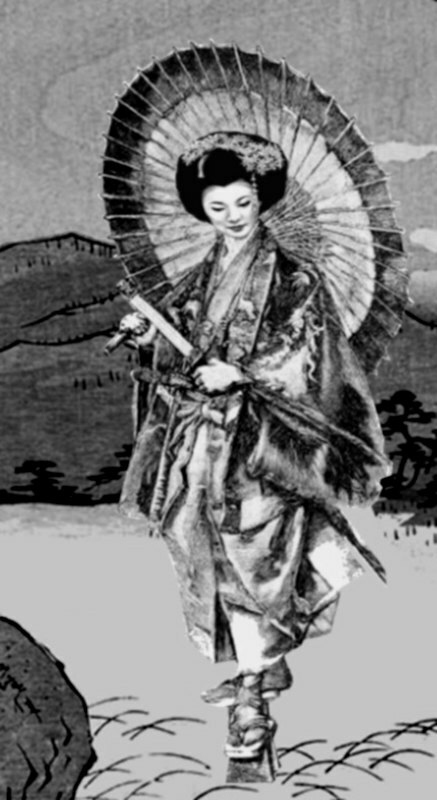 The Onna-bugeisha were a real social class, much like their male counterpoint, the samurai, and as such to simply write them off speaks much more about the embedded sexism that is still found in those who call themselves historians than anything else. 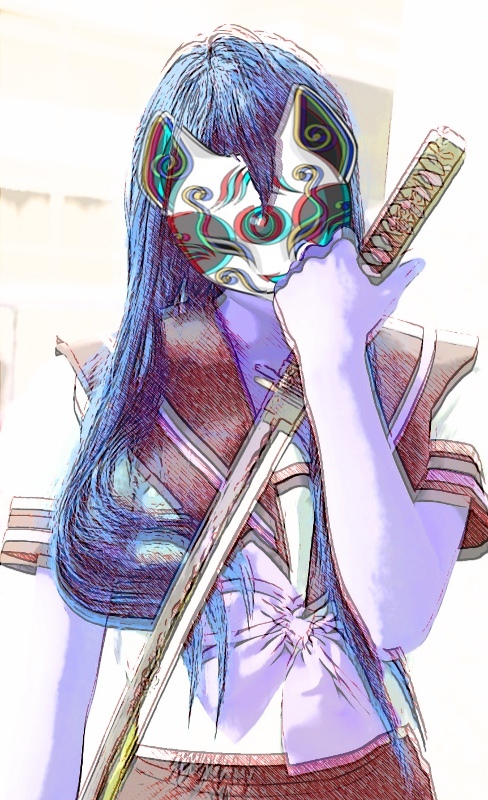 The Onna-bugeisha in this picture wears a mask of a fox (a trickster) and holds the long blade known as a naginata. 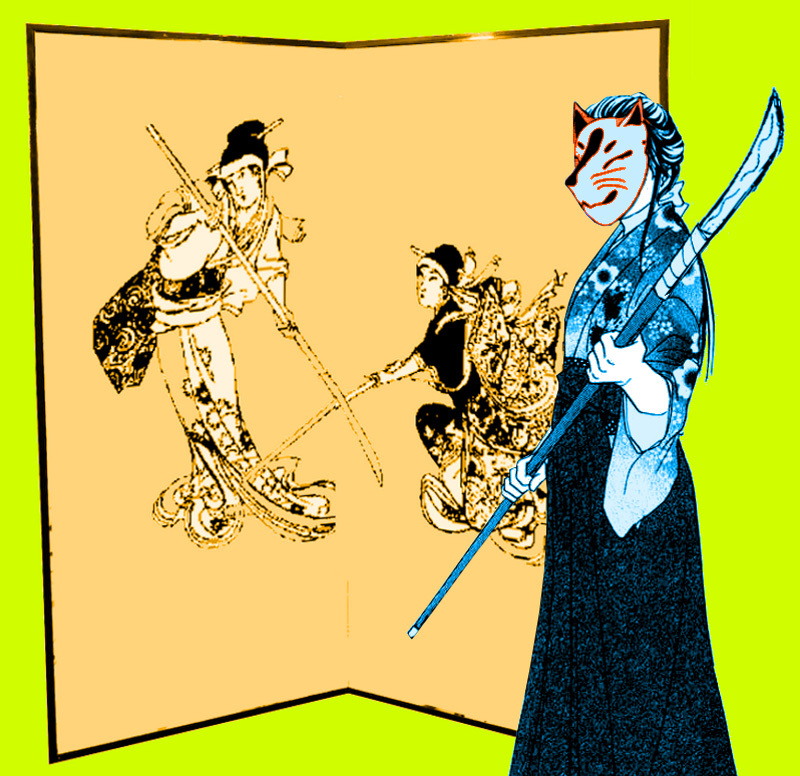 Behind her is a folding screen depicting two of her ancestors practicing (or fighting, hard to know) using similar weapons. Background based on the painting Takiyasha the Witch and the Skeleton Spectre. If the sky had not been filled with blinding snow Fuyu would have said there was nothing to dread that day. That there was no nameless fear walking upon the road before her. But she was winter-born and the first snows had been falling for an hour or more; the barren hill was now ash and nothing more. What wind there was came from behind her; rippling her robes, mussing her hair. The long slope before her stretched out until it met the clouds, disappearing into the rounded horizon as it melted into the gray sky. Fuyu had been following wagon tracks, gashes in the snow, where infrequent strangers had marked their passage some time before. With the failing daylight the shadows around her turned from blacks and pinks into omens and warnings. It was a veiled land; a land of mist and cold. The world all around her was quiet, and for a long moment she did not move, curious about the chance to see things for what they really were. She was still not halfway home. Fuyu’s eyes were not very good. She could not tell what made a faint ocher blur in the middle of the road until she was standing over it. Three brown grass stalks were poking above the snow; tall, thin, feathery late-autumn grass, now withered. It was so beautiful she was sorry to have to walk upon it. Fuyu stood looking down at the tracks, and then, because she had to hurry on, lifted her eyes to the horizon once more. She frowned. There was now something dark approaching, something baleful cutting against the low sky. A shadow? On it came. Fuyu had scarcely enough time to wonder before she saw that it was a nun. This was a curiosity. Fuyu could never understand the lure of Buddhism, especially when it specifically stated that women could never gain salvation because of the Five Hindrances; the female soul could not attain Buddhahood until it had changed into a male. Who would want to make themselves miserable by believing in that? Still, as the other woman approached Fuyu moved to one side and bowed her head. 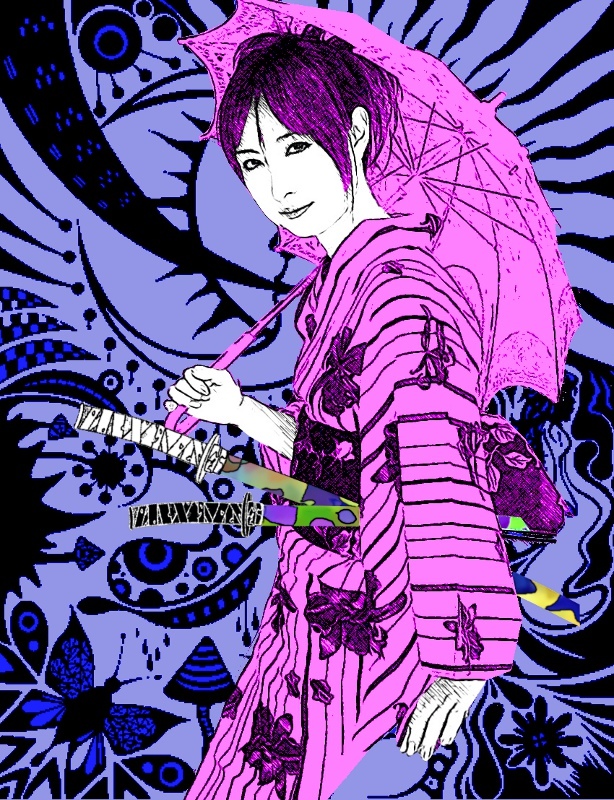 “You are traveling all by yourself, mother,” Fuyu said, even those the woman appeared to be younger than she was. This was Fuyu attempting to be civil. She saw so few travelers pass down her road, for she lived twelve miles from the nearest village and was curious to know where this strange nun was going. “To the temple, little sister, to the temple,” came the answer, spoken in a sing-song, little girl’s voice. It was not the type of voice one might hear at the temples, though. 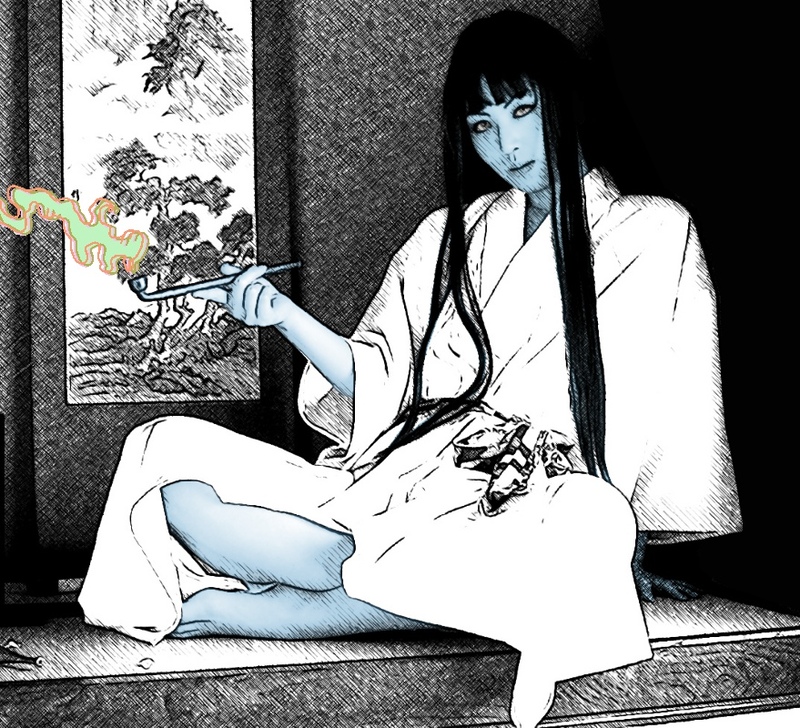 She must have beautiful at one time, Fuyu mused, but with her shapeless robes and shaved head she looked more like a corpse than anything that might visit her in her dreams. The nun was already five yards past her, walking with a gait that betrayed her youth. “Hai Yo-tsuoni,” came the musical reply. Hai Yo-tsuoni wasn’t so much a temple, it was more a roadside shrine that the few families who lived in the area used to placate the kami forest spirits when the need arose. There had been recently a funeral ceremony, Fuyu recalled. A little boy from the Watanabe family had been found dead three days ago. Attacked. At least that was what gossip in the village said, last time she had visited it. Fuyu turned to watch the stranger move off down the hill, then she paused, seeing something that she had not noticed before. The young woman was lame. Her left foot dragged behind her, the way polio would wither a limb. In the newly fallen snow her foot prints ran dark and uneven where the healthy foot had been forced to take most of the weight. 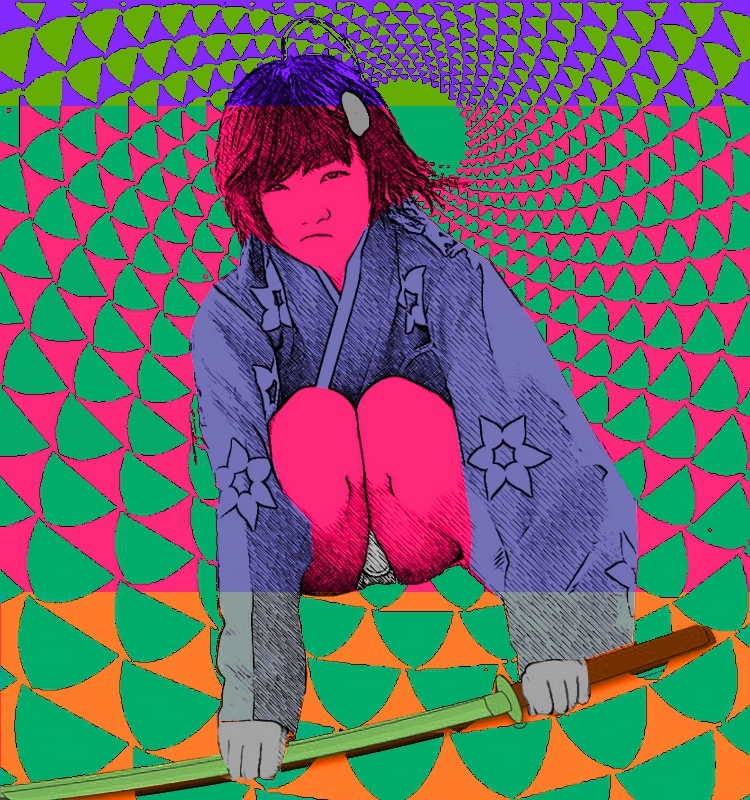 Fuyu shivered. The memory of the once beautiful but now gaunt face, those eyes that did not look at her as she passed by, the limping and odd voice of the strange nun. She did not know why, but there was something immeasurably lonesome, endlessly miserable in that robbed figure, now growing indistinct through the falling snow. Sighing, Fuyu continued her walk, cresting the top of the hill and then making her way into the woods. 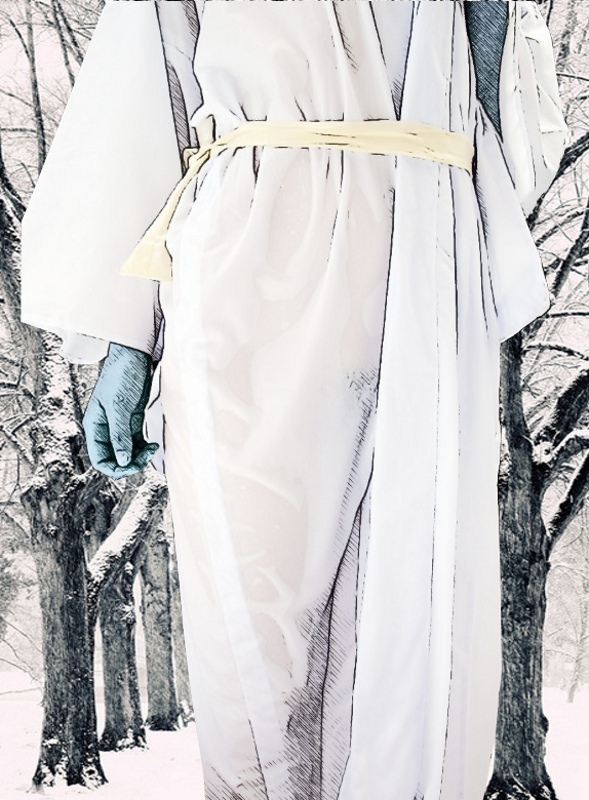 The more she walked, crunching through the snow, the more a strange mood began to creep over her. She fancied she heard voices, thin little moans, high up in the air over head. There was a chattering of laughter from the kami, or at least what she assumed to be the kami, on the edge of human hearing. Now all the joy and wonder of a walk through a first snowfall had vanished. The familiar rocks and trees were grotesque in the twilight, threatening. On more than one occasion she had come across monstrous forms pressing themselves between the shadows of trees, under fallen stones, swinging through the naked branches. However, these only turned out to be rotten logs or dry leaves caught in bare bushes, tricks of the snow. She felt like a dog whose senses have alerted her to the sort of unseen terrors humans can only discern when it is far, far too late. These woods did not feel like her own just then, and that, more than all the queer sights and sounds, was what scared her. It wasn’t the idea of something following her that she could not see that caused her to sweat, despite the cold, it was the terror that within her some primal consciousness that she did not know she even possessed had suddenly come awake. Men did not scare her. Demons, though, did. Finally, at long last, she found herself leaving the woods and entering her own clearing. Smoke curled from her chimney, which meant she had a guest. 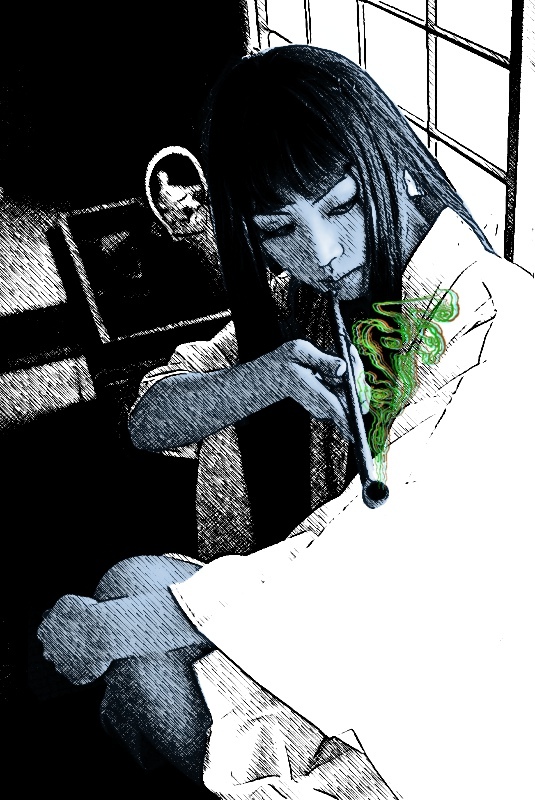 As she stopped to open the door to her hut she thought she heard a faint sound, a far off noise: alien, unrecognizable. She forgot the door was latched and pushed it harder than she intended. The rope broke and the wooden door swung into the room. There were no spirits inside, at least nothing to harm her. Turning sharply around from the smoldering fire sat an old Ainu woman, a neighbor who had just been in the process of filling her pipe. At the woman’s feet was Kuzunoha, Fuyu’s silver-tailed fox, who grinned, showing the tip of her teeth. “Auntie Marewrew-sama!” Fuyu cried, for she had not been expecting company. “Please forgive my absence. Is anything wrong?” She worried when the old woman came unexpectedly, for it almost always meant that one of Marewrew’s large family was dead or gravely ill. 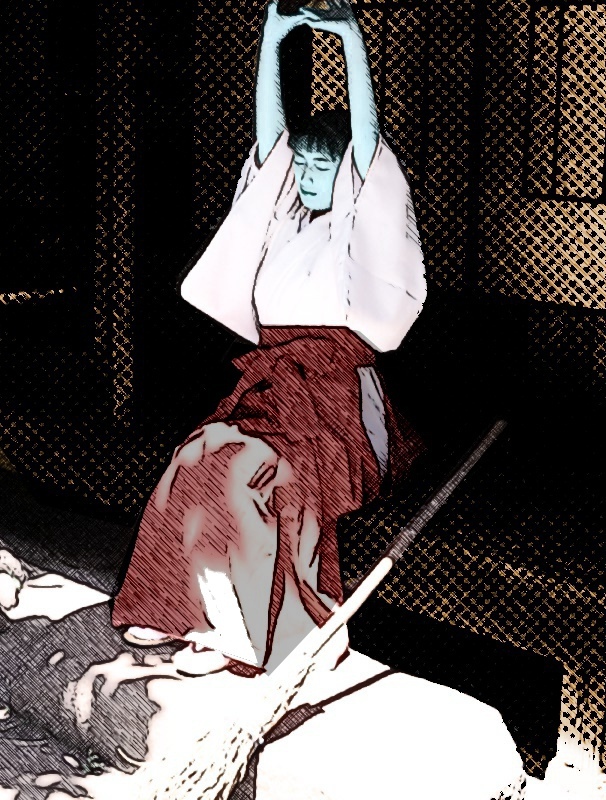 The old woman smiled as Fuyu carefully shut and barred the door using the rope she had recently broken. Fuyu was glad to see her old neighbor, for she was so chilled and tired from her walk. It was not good to sit alone in a hut of the first winter’s night and know there was something out in all that darkness hunting for you. When there was no more Koinu wa stew left they sat close together near the fire with Kuzunoha sleeping comfortably on Fuyu’s lap. Outside the wind had risen, full of lamentation in the branches that sounded something like the chatter of the little people of the forest. Fuyu saw that her adopted auntie was not ready to start for home, though the hour was growing late. 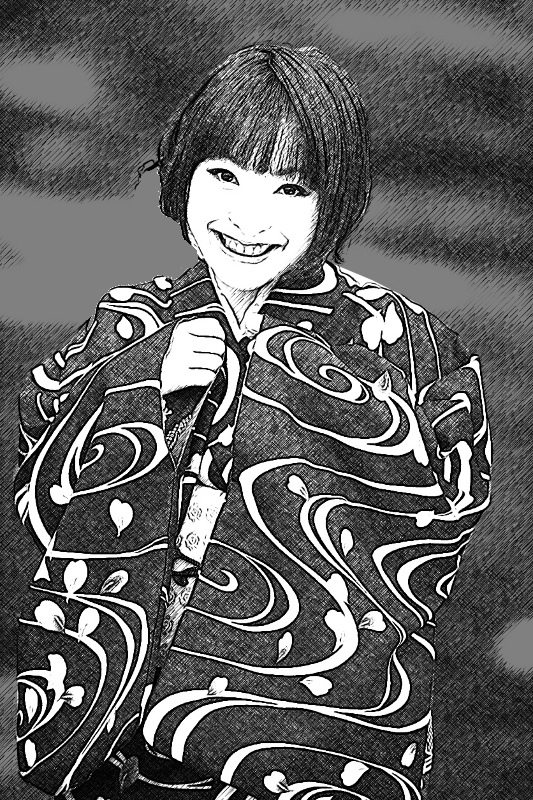 Fuyu was pleased with the request, but she asked if the old woman’s family would worry. 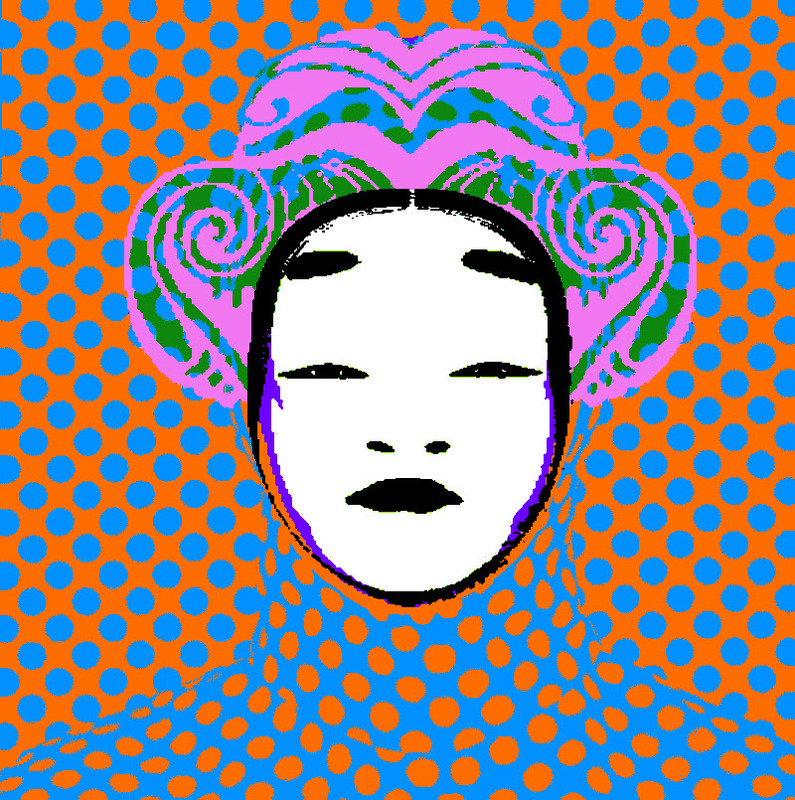 The old Ainu listened for a while to the wind, staring into the embers. Then she tossed a bark-covered log on it so that the sparks flew up the chimney. Fuyu nodded. She knew all about the Ainu’s belief in the “the little people below the leaves of the butterbur plant,” as they were called, the Korobokkuru, who helped farmers and aided the lost. She had never seen any evidence of their existence, but that didn’t mean they weren’t there. If Marewrew said they had left that part of Hokkaido then they probably had. It took Marewrew a while to fill her pipe. 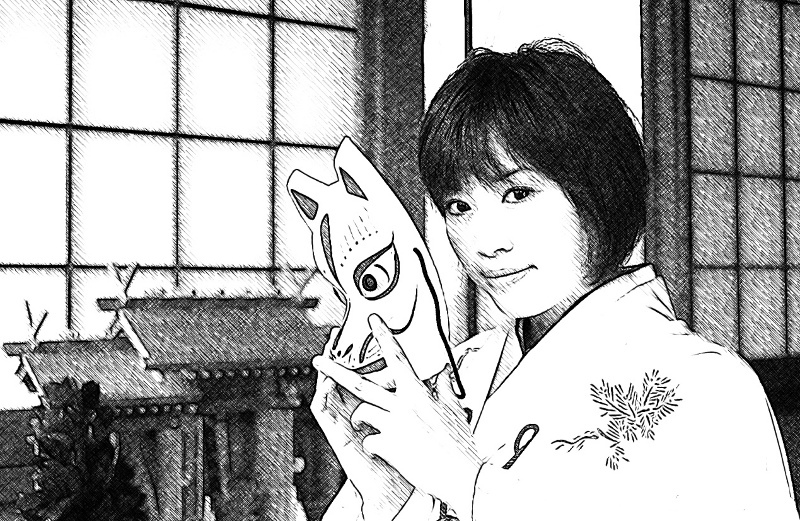 If Fuyu had not been used to her ways she could never have known that the old woman’s eyes were not on the clay bowl in her hand, but on her young host’s face, half-hidden in the shadows. “Why?” Fuyu was astounded. Marewrew’s family had not abandoned their homestead in all the time she could remember. Fuyu wondered if the old woman was afraid of the report that a few stray wolves that had come down off the mountains, earlier that year, for food had been scarce. But she knew that was nonsense. There was no fox, wolf or bear alive that Marewrew would see as a danger; a danger so terrible she would willingly abandon her family’s ancestors in their clay jars just to relocate to the shores of lake Kussharo. It must be something else. The two women fell into a tense silence. The fire between them cracked and sputtered. Finally Fuyu broke the silence. Marewrew jumped off her stool and stood before Fuyu, suddenly tall and alarmed. The younger woman had never seen her neighbor so excited as she was now. “Tell me about the nun first,” Fuyu began, still in a bit of shock. Though it was not late Fuyu was more tired than she realize. Long after she had gone to her sleeping mat in the corner, however, Fuyu saw Marewrew’s wrinkled face alert and listening by firelight. She absentmindedly played with an object of some kind in her two hands. The wind had died away; there was no more fairy laughter to be heard. She fell to sleep with Kuzunoha wrapped around her neck and to the sound of the fire, the soft pat of snow against the roof. But the straight old figure in her chair sat rigid, waiting, as if she were holding a vigil with the dead.